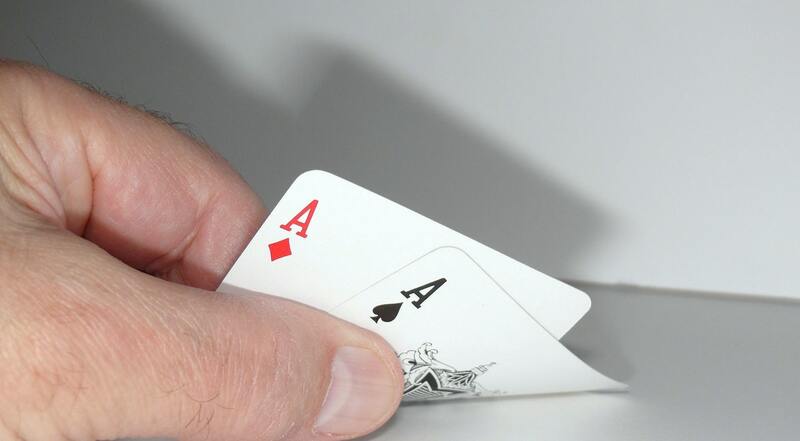 Sole suppliers – you might think you’re stuck with them in procurement. But once you know the why, you can plan a change for the better. 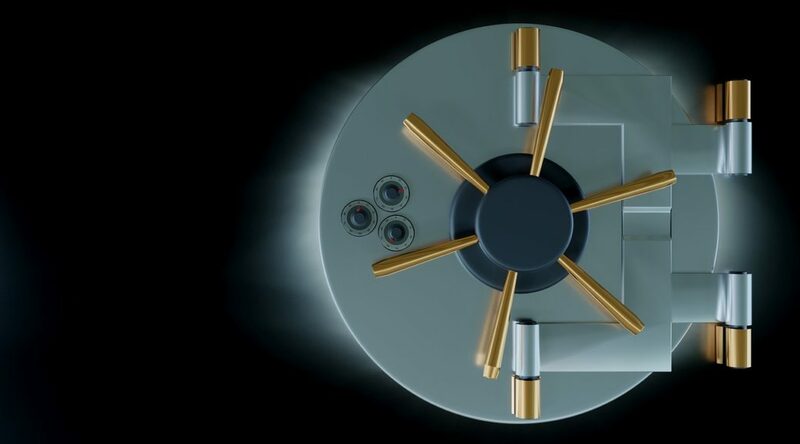 This article was first published on Future Proofitable. In the first part of this series, I discussed how sole supplier situations can occur. From monopolies, to high exit barriers and business attitudes, there are a number of reasons procurement might find itself in this situation. But now we know how these occur, the question to ask is how we can do something about them. Sole Suppliers – Can you do anything about it? Definitely – yes. What you can do depends on what you are dealing with, and which stage in the process you are in. If you can avoid buying the product in question, you should. You can also head off the sole sourcing situation by being involved in a process as early as possible. Making products in house is an option too. You may also be able to find a provider who offers similar services or products, and convince them to adjust their offering to your requirements. Integrate vertically by buying your supplier and making them your internal provider. Assess the full lifecycle of the product or service. Analyse what, if any, additional costs are related to object you are purchasing. Study alternative sources of supply, or look at the make vs. buy decision again. Even if you choose to buy, when the time comes to create negotiation leverage, you will have done half your homework already. Choose the right way of buying. If it is possible, could you buy machines and servicing or maintenance separately? Or, on the other hand, could you bundle the products and service together? Prepare a good contract in advance, and communicate it upfront. Build in price review mechanisms and no-penalty exit clauses. Alternatively, invest time in developing a full SLA, and ensuring this lasts for the whole relationship. Share the information (technical, legal, commercial) early in the process with all suppliers. Cross-validate information and responses with specialists or 3rd party service providers. Finally, analyse proposals with the purpose of identifying “unique” solutions. What time of the year is it and when does their financial year finish? Is there a reason to believe that tendering on a specific time frame might give you better or worse conditions? Or negotiating with software companies closer to their financial year end, when they are likely to be more aggressive with pricing. Consider geographical aspects. If you are negotiating with a large multi-national, perform a market test of their pricing policy in different countries. You might be surprised that a branch, located somewhere further away from the central function would get a better group deal purely because of the location. What sales strategy are they using? Are they more aggressive with the pricing of new solutions or new technology? Are they interested in growth? Market entry? Stopping their competitor entry? Can you invite someone new, who is not yet in the market? Does the size of the contract matter? Do not forget to negotiate small value adding add-ons and other benefits to the contract. You can ‘sell’ positive references, feedback and referrals. You can help to reduce the supplier’s risks and become a better customer (implementing electronic ordering and invoicing tools, consolidating POs). Or you could threaten them with moving to an alternative supplier, or bring one in. One thing to think about might be a change to your business strategy. Could you move the location of your HQ (for a critical product), or give up certain markets or products? You could invest in in-house R&D, work with laboratories and universities. While doing this, educate business users. Challenge old ways of working, and help to eliminate all pseudo-sole suppliers. Re-evaluate short term switching costs and compare them against long term business losses, if you decide (once again) not to change anything. Should you do anything at all? That is the question, too. The saying goes “nothing personal, just business”. Procurement should also be business oriented and invest its resources where they matter. Should you start any project? Well, that depends. If this is something that you must do routinely (review a category or contract), you might consider how much time and effort to invest. And similarly, if the prize you are after is big enough, it’s probably worth spending time on it. Based on the situation your business is in, you should perform opportunity analysis and evaluate your expectations. It’s not only about the size of the spend. With sole suppliers, there is another level of complexity to be evaluated – the nature of the business situation. You can do this for single supplier situations, too. 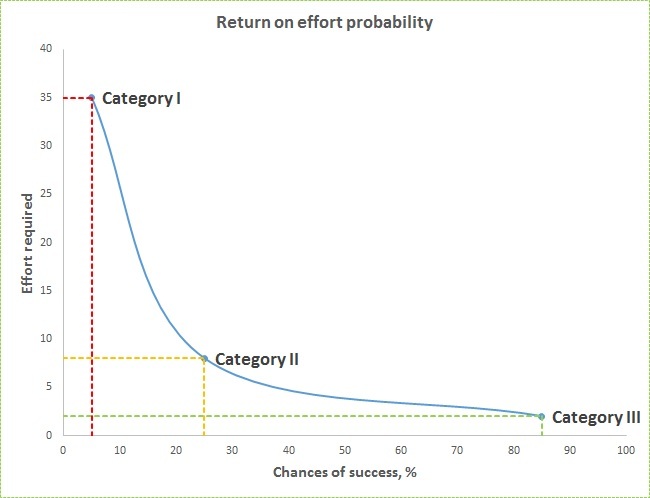 For the categories mentioned above, approximate ratio of effort to success are shown in the graph below. Required effort is a relative number and can vary in units of measurement (days, weeks, months, people involved). It’s only one part of the equation in that it performs a sense check from Procurement’s perspective. Another key part in projects like this is implementation. In many cases, it can (and will) end up in a change project. If you don’t want Procurement’s credibility to suffer, you must make sure that savings promised and savings achieved are as close as possible. If the dissatisfaction with the sole supplier situation outweighs resistance to change, and if you have a plan on how to act, you increase the chances of success. At the same time, it suggests what you can do if any side of the equation is not favourable. You can increase internal dissatisfaction among key stakeholders (clearly communicate risks and losses of the situation to finance people), or reduce resistance to the project (get the buy-in from engineering, technology, sales and other departments). 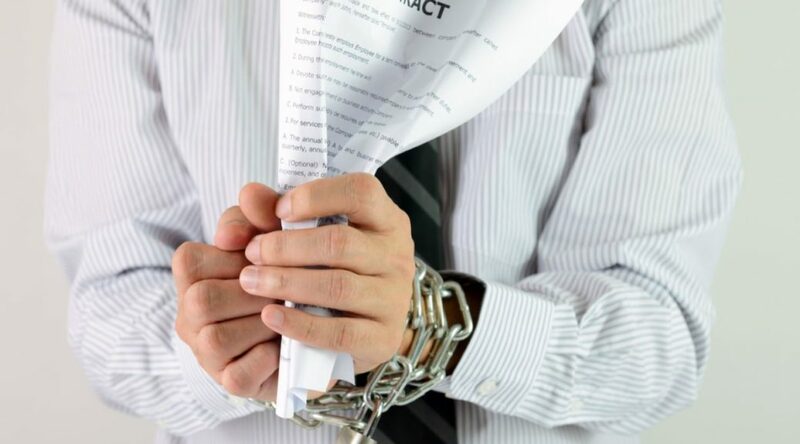 How Can Procurement Break the Chains of Sole Sourcing? Whether its design specifications, or traditional attitudes, sometimes procurement gets painted into a sole sourcing corner. I am jealous of those who have never had to deal with true sole suppliers. I think IT buyers will understand me best. It’s just not that much fun. Let’s take a closer look at what sole or single sourcing is, and how best to deal with it. I will cover the subject in two articles. The first one covers what it is, and the second will contain tips and hints how to deal with these situations. If you there are a few suppliers in the market who you could buy from, but you choose to stick with one supplier (leaner supply chain, eliminated duplicating logistics and management, administration costs), you have a classic single source situation. If there is only one supplier in the market, and no alternatives, you have a sole sourcing situation. There are many office cleaning services providers out there in the market. However, for a list of very good reasons, you choose to outsource it to one service provider. That would be single sourcing. Now, imagine five different suppliers working on your ERP system creation and implementation at the same time, doing the same job for the same part of scope. Not fun. Or imagine that your supplier comes up with exactly the product you need for your manufacturing process, but patents it and keeps on increasing the price at every opportunity. Even less fun. You keep the competition, because the supplier can be easily replaced. Negotiation leverage is at its maximum level like this. At the same time, you spend less time for supplier management and supply chain administration. You have consistent quality of items or services delivered. Or, if not, deal with it in one go. You eliminate all non value-adding activities (some examples here). The supplier will be more willing to work with you on various cost reduction or services improvement initiatives. The threat of losing business in the future will be a big motivator to not overcharge you. There are a variety of reasons why a sole supplier situation can form. Some are more to do with perception and resistance to change, while others are truly sole supplier situations. They can be categorised in three ways. Market monopoly – utilities (water, gas, electric); Governmental services. Patents – technical designs; chemical formulae. Equipment investment – when supplier provides plastic granules storage and supply systems; cleaning chemicals’ supplier provides funds for equipment. Digital solutions (and their switching costs) – you may have had big leverage during first negotiations, but once the initial contract period is over you find yourself dependent. The supplier is technically not sole source, but switching costs are so painful that it gradually turns into one way street of constantly increasing maintenance bills. Manufacturing supply chain integrations – this can often happen naturally, or through pre-existing relationships between different tiers of suppliers. Along the way, one supplier is sold to another, or bought out, and a partnership is ended even though production lines are tied together. Industry regulations (or agreements) – for instance, in order to be able to insure cash in a safe, an insurance company might require a specific quality certificate from a very specific certification organisation. In this case, there is really only one option for supply. Frequently, evaluating the situation in the business is more about perception and will, rather than based in fact. Identifying these can bring big benefits. Business users’ preferences – surprisingly, there are quite a few categories of spend where business users are permitted to have preferences. Next time you complain about resistance from stakeholders, consider the number of colleagues who work with particular safety equipment, or similar. And yes, over time, people tend to form preferences for brand name products. Implementing any change might be challenging. Historical heritage – the classic “we’ve always done it this way” situation. It always been bought from this supplier, and only this supplier. Business’ requirements – technical specifications, prepared by engineers. Delivery requirements, set by business users. Packaging requirements, defined by operations or logistics or marketing. So now you know how these situations may occur. The question is, can you do anything about it? And how? You’ll have to come back to find out more! It’s a tall order to come in and completely transform the procurement function within an iconic global company. But Kelly Irwin didn’t beat around the bush when she started as Head of Procurement at the Australian subsidiary of Swiss group at Holcim (which has since merged with the French group LaFarge) five years ago. The company, which is a leading supplier of aggregates, concrete and concrete pipe and products, had plenty of room for improvement. In fact, the company’s procurement department was mostly handling complaints, rather than handling strategic buying for their future. The 20+ year procurement industry veteran soon realised the magnitude of the role, so set about implementing improved systems and processes for the procurement function. The first step was to establish a centralised purchasing model, then build a talented procurement team to support her role. “It was a very dysfunctional team that had little direction, that wasn’t aligned with the company’s strategic directions,” Irwin says. Today, Irwin heads of a team of 34 people and manages a mind-boggling AUD $900 million budget. She has implemented and centralised structure and processes within the procurement function. She has previously worked in procurement for Qantas and building firm Boral, though this role with Holcim Australia is her first where the procurement buck stops with her. With those changes bedded down, her remit is again broadening, and she will now handle all buying across New Zealand for the company, with a recent trip across ‘the Ditch‘ to establish processes there. Not only this, Irwin has developed a highly effective procurement team, which has been awarded the Internal Customer Excellence Award for Holcim Australia for three years in a row. Her approach has transformed the procurement function for the company, with her team has an 80 per cent engagement score, which was the highest in Holcim Australia in 2015. Irwin has strong capabilities in building effective working relationships with teams, development of Procurement strategy, management of supplier and keyholder expectations, highly developed negotiating skills, contract management, risk management and compliance expertise and operational experience through the implementation of change initiatives and process improvements. Irwin was also recently awarded the CIPS Procurement and Supply Chain Management Professional of the Year. Irwin keeps staff informed on all aspects of the business, has an open door policy, and doesn’t mind being contacted after hours. “I recently read that people play harder when they know the score. This is something Holcim Procurement do well. Not only do we have clear goals, (quantitative, savings targets), but we have the measurement tools the accountability element to keep score on how we are tracking. “I believe this shared goal, as well as individual accountability to reach this goal builds individuals’ commitment to team uniformity direction, and overall engagement,” she says. To emphasise her point, she recalled talking to someone in procurement who had major issues trying to speak to the head of the department. This was slowing down their ability to tackle their own role. Nearly 70 per cent of her team is degree qualified, though that wasn’t a prerequisite when she entered the industry more than two decades ago. “I always look to hire people that complement the skills we have, and find people who have talents in areas we need to improve in. Like so many working in procurement, it was never a deliberate decision to follow this career path. Irwin deferred university and entered the workforce before stumbling into a procurement role, with the sound of buying things for a living appealing to her. She’s since completed a number of qualifications, certificates and management courses that support her role. Irwin describes herself on being approachable, down to earth and honest. And she doesn’t take herself too seriously. “Though depending on where you’re standing, that can be a bit rough as well,” she admits. Procurement professionals need to be inquisitive problem solvers with strong communication skills, she says. As far as the future goes, Irwin says the procurement function has an increasingly broadening remit. Kelly Irwin is one of the leading Australian professionals to speak at the second annual Women in Procurement 2016 event, which inspires leadership, advances careers and drives innovation in procurement, and supply chain function and practice. The event will be held in Melbourne in 21-23 March. Book your ticket here.